Microsoft Office 2007 is the latest upgrade for the Microsoft Office family of products, and brings new productivity and application integration features. Many organisations are currently planning to upgrade, and install Microsoft Office 2007, despite the software being available since November 2006. This is mainly down the fact that the software brings a huge range of new features. To migrate to Microsoft Office 2007 successfully, users must ensure they are using the right Windows operating system, which means Windows XP with Service Pack 2, Windows Server 2003 with Service Pack 1, or Windows Vista. Microsoft Office 2007, officially called 2007 Microsoft Office system, was released around the same time as Windows Vista. As a result, many business users have been evaluating the office productivity software throughout 2007, alongside Windows Vista, in order to manage the volume of change that the software would bring to their organisations. The new features of Office 2007 include an entirely new graphical user interface called the Fluent User Interface, also known as the Ribbon User Interface, which replaced the menus and toolbars of previous versions of Office. Microsoft Office 2007 also includes new applications and server-side tools. Among these are Groove, a collaboration and communication suite for smaller businesses, which was originally developed by Groove Networks before being acquired by Microsoft in 2005. 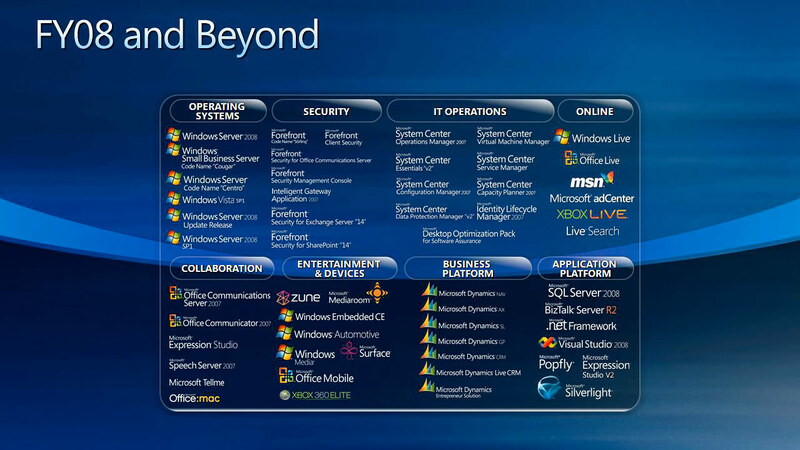 Also included is Office Sharepoint Server 2007, a major revision to the server platform for Office applications. This supports "Excel Services", a client-server architecture for supporting Excel workbooks that are shared in real time between multiple machines, and can be viewed and edited via a web page. Microsoft FrontPage has been replaced by Microsoft Office Sharepoint Designer, which is designed to develop Sharepoint portals. One key feature of Office 2007 is the ability to integrate Office applications, like Excel and Outlook, into enterprise applications such as SAP. This allows users to integrate supply chain, business intelligence, communications, and enterprise content management components into their familiar Office applications. Microsoft and other third party organisations have a number of migration tools and documents available to help IT managers with their Office 2007 upgrades. Office documents have a new default format, Office Open XML, which uses the smaller XML file format, and free add-ons are available that let older Office editions open documents created under the new Office 2007 format or convert between file formats. Then there is the Office Migration Planning Manager, an executable that surveys the Microsoft documents on an organisation's desktops, and reports to a central server, colour-coding a report to highlights particular issues. Another tool is Local Installation Source (LIS) which uses the Windows Background Intelligent Transfer Service (BITS) to "drizzle" code onto desktops over a network over a long period of time - even months. This enables the IT department to prepare desktops for the upgrade by delivering new Office applications and features incrementally before going live 'en masse'. For many larger organisations, this is a preferable option.